Your stomach turns when televangelists make your faith look strange and irrelevant. You are bored with Christianity-light and empty New Age sentimentality. You want to plunge deeper into your faith, but don&#x2019;t know where to start. You mourn the lack of logical arguments in the conservative church. You are tired of embarrassingly shallow, syrupy-sweet Christianity. You are dissatisfied with what you are being told in church. You are willing to reevaluate your beliefs. You want to move to the next level. You thirst for more. This is your book. This is a refreshingly honest struggle. Summers looks at his life through the eyes of some of the world&#x2019;s greatest theologians. He writes in a conversational style that is at times whimsical, at times scholarly. He is open about depression, drugs, alcohol, and crises of faith, and he reminds us that there is an answer to life in the midst of all the confusion. One thing is clear: Summers rejects phony Christianity and is willing to openly struggle in front of the reader. He struggles with personal holiness and does not hide that from the reader. Along the way he gives needed help for those who want to have a clearer understanding of how to interpret the Bible, how to understand the Old Testament, Jesus, Paul, and some of the more difficult doctrines of the church. This book is packed with information and a first-class list of sources. Summers is unafraid to criticize his conservative evangelical roots, relishes asking the tough questions, and lovingly writes to keep us from being intellectually lazy. You rarely hear this type of dialog in a church setting. Imagine having a cup of coffee with someone who has studied Theology and still struggles with matters of faith. Imagine eavesdropping on his prayers and finding out that you are not alone... Also Available Bittersweet: Acoustic Piano Pieces. Summers plays original meditative music on a Yamaha Grand piano. Imagine popular piano music with a touch of jazz played on solo piano. Order Bittersweet. Compact Disc available from Infinity Studios at: http://paulasay.indstate.edu/bittersweet/. Second recording available soon. Your stomach churns when you see televangelists make your faith look stupid. You are bored with Christianity-light and empty New Age sentimentality. You want to plunge deeper into your faith, but don't know where to start. You mourn the lack of logical arguments in the conservative church. You are tired of embarrassingly shallow, syrupy-sweet Christianity. You realize it may be possible that your pastor could be wrong. You are dissatisfied with what you are being told in church. You are willing to reevaluate your beliefs. You want to move to the next level. You thirst for more. This is your book. 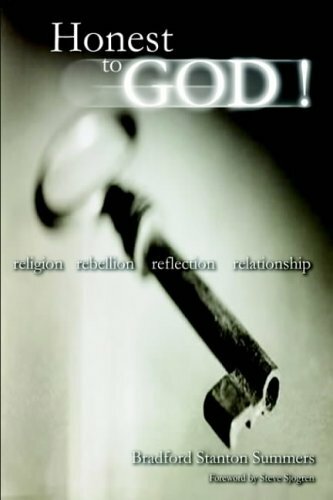 Read an educated Christian's refreshingly honest struggle to find meaning. Bradford Stanton Summers looks at life through the eyes of some of the world's greatest theologians. Honest about depression, drugs, alcohol, and crises of faith, he reminds us that there is an answer to life. Summers is unafraid to criticize his conservative evangelical roots, he relishes tackling the tough questions, and he lovingly writes to keep us from being intellectually lazy if we want our faith to be relevant in today's world. You won't learn this stuff in Sunday school! You say you want a revolution?<p></p>Let's go!